Exactly the emotion we felt when we headed up the Santa Monica pier only to find Pier Burger was closed for refurb. The other Pier walkers did not appreciate the Platoon-style kneeled screams that followed. We lamentably headed back into central L.A., discussing an alternative plan of action, when the glorious kaleidoscopic glow of a congress of food trucks caught our eye. A quick left turn later we realised we'd stumbled across the Santa Monica food truck lot and, more specifically, Rounds. Who will dance, on the floor, in the Rounds? The menu of 'premium burgers' hosts a variety of styles tagged by 'The' all too familiar naming convention, with ridiculous trimmings like breaded jalapenos, chipotle aioli and avocado mash for the topping minded. Not wanting to over-egg the burger pudding first visit, we went for a classic with cheese. 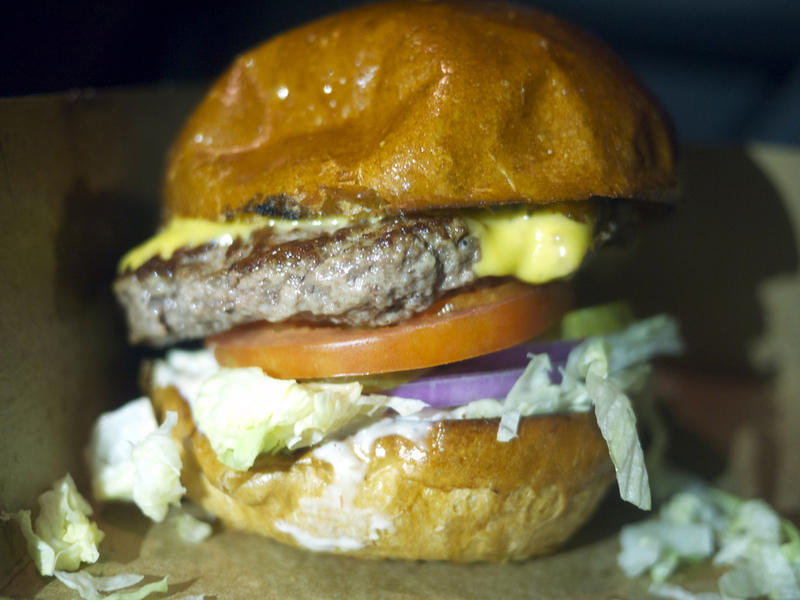 You can check fundamental ingredients box here, it is in it's essence a classic American burger. A tomato slice, rings of red onions, pickles and shredded iceberg are liberally inundated with a creamy thousand island sauce. Perched atop was a perfectly crusted, nicely medium chuck patty with a bright, American cheese melted just-so on top. And it was all amassed within a sleek, spacious brioche which, despite looking like a partially deflated balloon, was a great example of the thin crusted, soft-centered bun that we are fans of. The crunch, the sauce, the beefiness, the softness were all there. Yet the thousand island was a bit too creamy, and the bun was a bit too buttery, a sweet combo that the meaty piquance of the other ingredients struggled to offset. An otherwise tiny fault in an unexpected treat of a late lunch by the beach. You'd do worse than to stumble across this truck, or hit up one of their bricks 'n mortar locations around L.A.